There's no doubt that you need a pair of work boots that can work hard. Here at Working Person’s Store, we have exactly that and more. These KEEN Utility Men's 6-Inch Coburg 1018023 Waterproof Steel Toe Work Boots are extremely durable, so you know they'll get th ... (see full details) (see specifications) #1018023. There's no doubt that you need a pair of work boots that can work hard. Here at Working Person’s Store, we have exactly that and more. These KEEN Utility Men's 6-Inch Coburg 1018023 Waterproof Steel Toe Work Boots are extremely durable, so you know they'll get the job done well. But they're also waterproof, comfortable, and built with characteristics that can keep you safe and working longer. These men's waterproof boots are fully capable of withstanding all the work you'll inevitably put them through because they're designed right here in the U.S.A. with durability in mind. They're medium duty boots after all, and as such, they feature an upper crafted from leather and textile to create a tough-tech abrasion-resistant fabric. The leather makes the upper quite resistant to wear while the textile increases flexibility and decreases weight. The rubber outsole found beneath the upper is built with a heel guard to prevent wear from bumps and scrapes. In addition to strength and long-lasting quality, these men's steel toe boots are waterproof. The leather and textile uppers are completely waterproof, so you won't have to worry about having uncomfortable, soggy socks. But the men's steel safety toe boots take it a step further in terms of protection from wetness; they're also designed with KEEN.Dry's waterproof breathable membrane that keeps your feet dry without suffocating them, Cleansport NXT technology that maintains odor, and a moisture-wicking textile lining that makes sure interior wetness, such as sweat, doesn't become a soggy, smelly burden. Beyond being able to keep you dry and withstand harsh labor, these Coburg leather boots are protective. 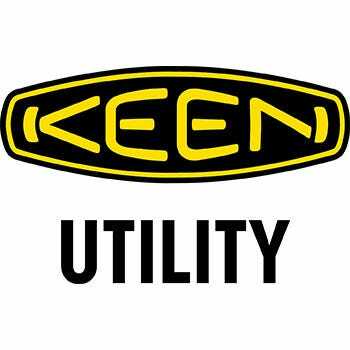 KEEN built them with a steel toe cap that is designed specifically for the foot inside. The safety toe work boots are made with left and right asymmetrical toes to give you the best fit and feel while offering more room and outstanding protection. The steel toe meets the requirements for the safety standard ASTM F2412 and F2413-11 I/75 C/75 EH, which means it can protect you from drop impact and compression. The EH at the end of the standard stands for electrical hazard, and the rubber outsole is responsible for achieving it. Essentially, the outsole will protect you from being electrocuted if you come into contact with some open electrical circuits. Plus, the outsole is also oil- and slip-resistant as well as non-marking. It meets the ASTM F1677-96 MARK II non-slip testing standards. Finally, these men's slip-resistant boots are comfortable, and you need them to be if you're going to wear them for extended hours. The EH oil-resistant boots are crafted with a removable dual-density ethylene vinyl acetate (EVA) footbed that has a metatomical design, which is engineered to provide superior arch support while cradling the natural contours of your individual feet. The footbed is accompanied by a direct-attach polyurethane (PU) midsole that reduces soreness from use. The thermoplastic polyurethane (TPU) shank creates midfoot comfort by absorbing the shock resulting from collisions with the ground. That way, your feet are less worn out and can work longer. Lastly, the KEEN boots are made with a hydrophobic/hydrophilic 2-zone comfort technology lining, which makes sure your sweat doesn't ruin the great feeling you'll have while wearing them. If it’s comfort, durability, and protection from wetness and workplace hazards that you seek, get these KEEN Utility Men's 6 Inch Coburg 1018023 Waterproof Steel Toe Work Boots here at Working Person’s Store today. KEEN Utility Boots: Men's 6 Inch Coburg 1018023 Waterproof Steel Toe Work Boots is being added to your cart.